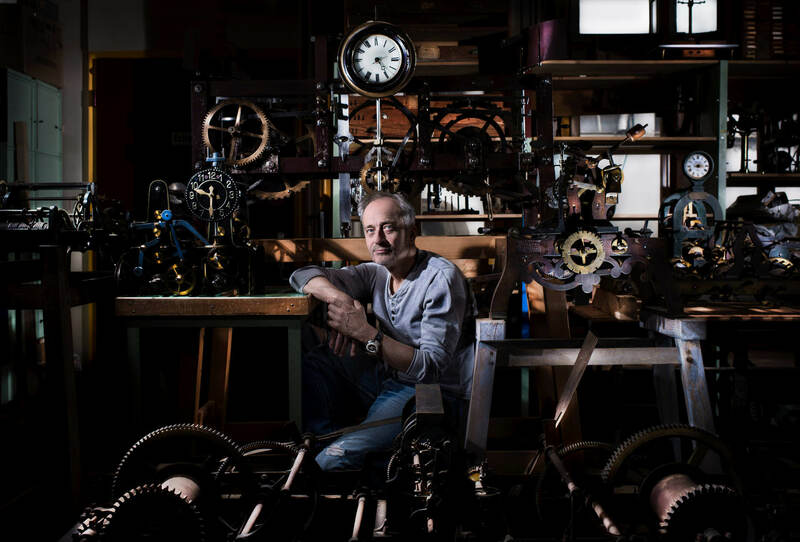 A freelance journalist working from Basel, Timm Delfs is also the owner of Zeitzentrale, where he sells all sorts of timekeeping instruments including his particular favourites: sundials. Two seasoned industry professionals, neither of them involved with any brand or group, have teamed up to develop a watch that might give some food for thought to the big players. Pierre Nobs is one of those people who won’t retire unless forced to. He is a visionary whose late lamented Ventura brand was a pioneer in many respects, introducing a strict design language and contemporary materials into traditional watchmaking, and creating the first hybrid digital watches driven by kinetic energy. Simon Husslein, on the other hand, is a true industrial designer and the watch industry just one of many fields that call on his services. 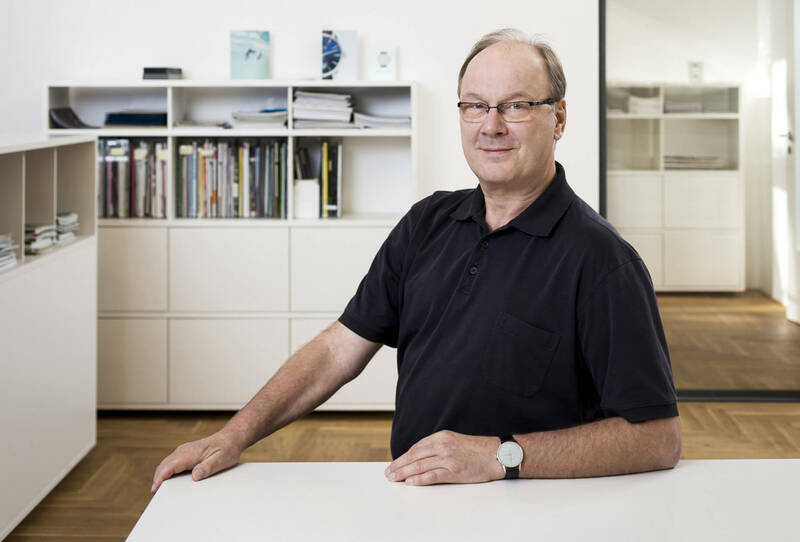 He worked for the Zurich-based Hannes Wettstein studio, whose founder designed most Ventura models. Given that Husslein was involved in many of the later Ventura designs, he and Nobs have known each other for some time. 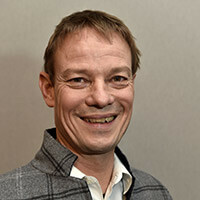 After Hannes Wettstein’s untimely death in 2008, Husslein continued to work for his mentor’s studio, and also founded his own Atelier Simon Husslein in 2015. His designs, be it watches or other objects like furniture, have won a number of international awards. 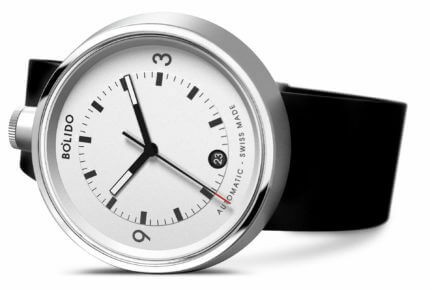 One of his regular customers is the German brand Nomos, which is well-known for its sober but no less cheerful designs. Their latest project is very young. 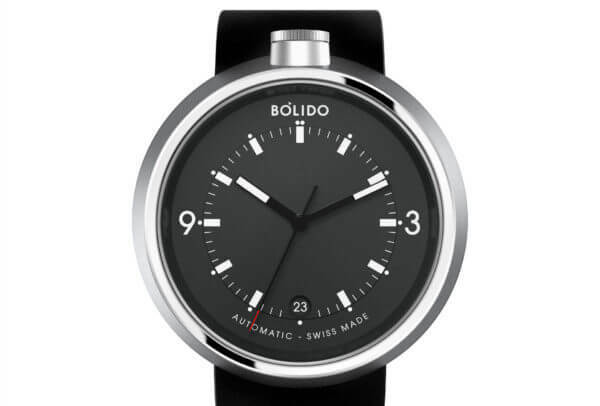 In fact, if you consider how long it takes an established watch brand to develop a new caliber – five years – you wouldn’t think it possible for two individuals to come up with a new brand and an actual new watch within just one year. Nobs and Husslein met last January to discuss a project Nobs had in mind. He was intrigued by the way crowdfunding enabled people to realize and finance products that previously wouldn’t have been possible without convincing an industry or a bank. 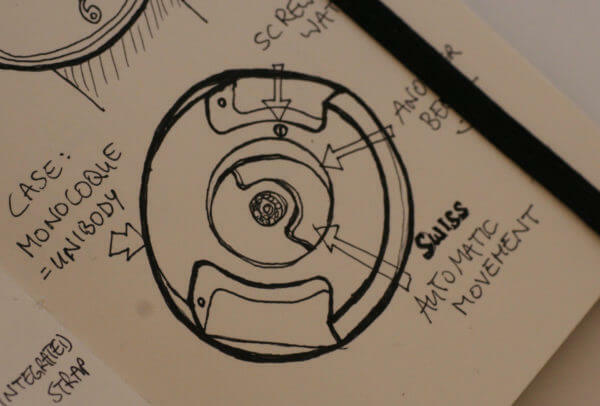 He also wanted to start a new project in the watch industry and, seeing the price range of the most popular smartwatches, wanted something mechanical that might be attractive for a similar budget. It was Husslein’s belief that the watch case offered the greatest cost-cutting potential, if constructed in a way that required the fewest machining operations. Instead of thinking fancy shapes, Husslein set out to find a shape that could be machined with the fewest operations and the simplest possible machine. Today’s computer-controlled 5-axis machining tools are able to cut the most complex forms imaginable out of a solid block of metal. However, programming them takes an awful lot of time that only pays if the number of pieces produced is high. Secondly, the more complex the shape, the longer it takes the machine to perfectly produce each individual piece. So, instead of thinking fancy shapes, Husslein set out to find a shape that could be machined with the fewest operations and the simplest possible machine, knowing that subcontractors reserve the most modern machines for jobs that yield the most revenue, i.e. the most expensive watch cases. Husslein cast his mind back to the Seventies, when the first automatic lathes for case-manufacturing appeared on the scene. 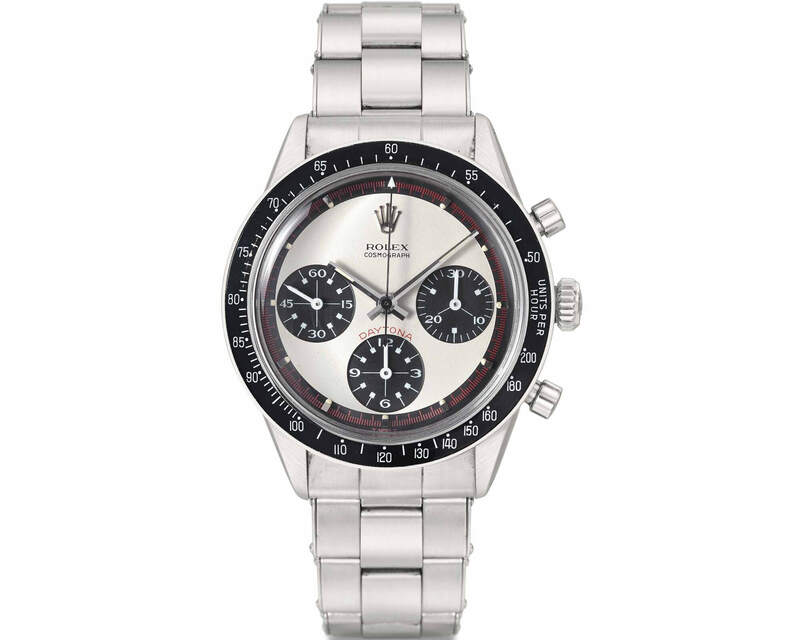 Their limited possibilities influenced the design of an entire generation of watches: the shape of a great many sports watches from that era is based on a cone with no lugs for the strap. Not that he wanted to simply revert back to something that had already been invented. There had to be a twist somewhere. In fact “twist” is a good expression for what Husslein came up with: his first designs proposed to machine the case from the front and the back, but with a slight angle of 4.2° in the lathing axis. The result is a round case whose back and front aren’t parallel. The second solution to reduce costs was also widely used in the Seventies. In fact most of Gérald Genta’s design classics rely on it: the monobloc case with no separate, removable back. The only concession Husslein made in favor of watch enthusiasts is a lens fitted into the back to open the view onto the rotor of the automatic movement. The movement is slipped into the case from the front, then sealed by pressure-fitting the sapphire crystal into its gasket. The large-diameter crown is located at the 12 o’clock position where the case is thickest and thus adds appeal to the design. The openings to accommodate the rubber straps also had to be as simple as possible. 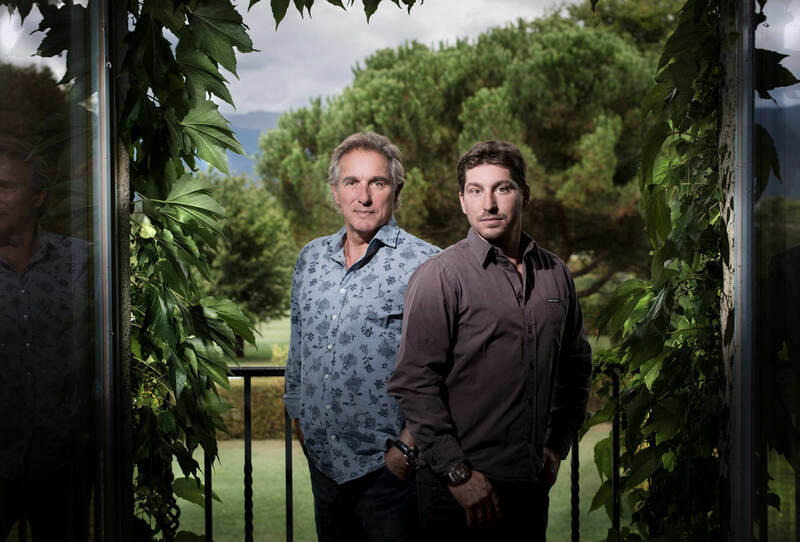 When searching for someone to make their case, the pair soon gave up on companies working for the watch industry, which were either too busy or too expensive. Their travels around the Jura finally brought them to the door of a young precision turner, who made them an offer they couldn’t refuse. The automatic movements will come from STP in southern Switzerland; dials will be produced in Germany and straps will come from Italy. 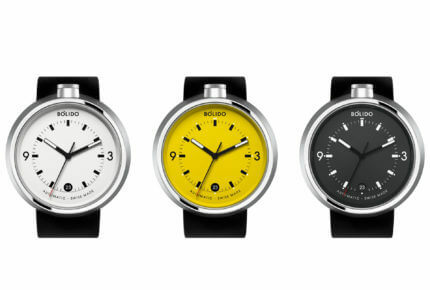 Since the watches will be assembled in Switzerland, they will easily qualify for the new Swiss Made label. They decided to name their “baby” Bólido, which is Spanish for meteor. “It’s dynamic and can be pronounced in just about any language,” says Pierre Nobs, laconically. 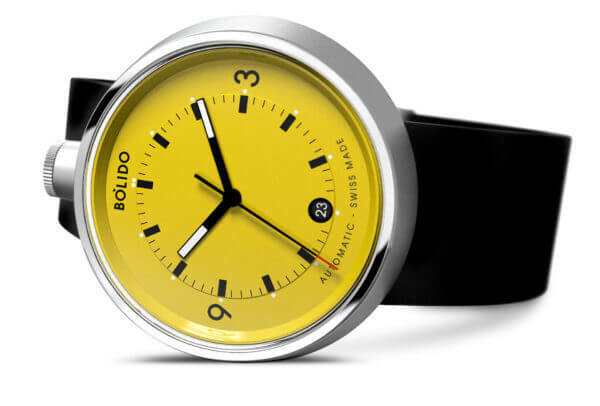 Having ascertained feasibility, they decided it was time to put Bólido onto the Kickstarter platform to generate interest and raise money to start production. 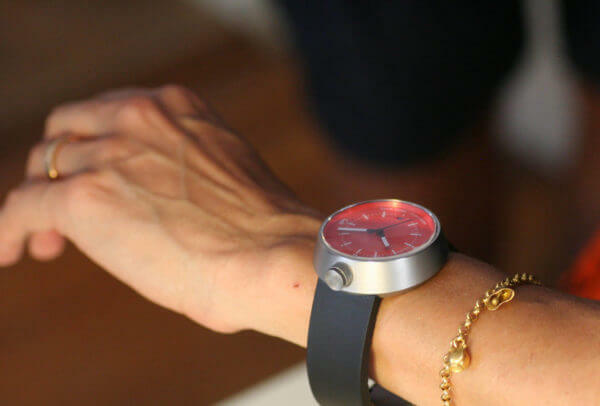 By using Kickstarter, they are in a way using a method applied long ago by watchmaking genius Abraham-Louis Breguet, inventor of the “montre à souscription”: a watch for which customers had to pay a certain amount in advance to enable the watchmaker to buy the materials for production. 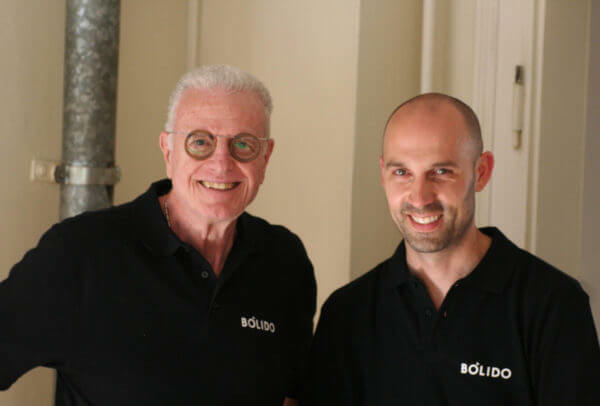 Bólido made its Kickstarter debut on June 16th and within 16 hours the goal of CHF 58,000 to launch production had been reached. The project can be supported until July 16th by ordering a watch at the entry price of CHF 430. After that date, the watches will be sold online for CHF 690 (including VAT). “I am confident that we will be able to deliver the first watches by September this year, because we remembered that ordering the movements was the most important thing,” says Simon Husslein with a smile.